The Headlight Revolution V.4 LED Low Beam Headlight (previously V.3) conversion kit is one of the only kits on the market that allows for PLUG AND PLAY installation on the 2009-2018 Dodge Ram with factory reflector headlights! Watch the video for detailed install instructions. NOT FOR USE WITH OEM PROJECTOR-STYLE HEADLIGHTS THAT WERE AN OPTION ON THESE TRUCKS! V.4 Bulbs NOT compatible with 2015 Rams, Please choose the Diode Dynamics SL1 Ram kit. Since 2009 until 2016 the Ram trucks used a big reflector style headlight housing and most people say it could have come with better lighting. If you want to upgrade to brighter lighting without changing the entire housing out, then this LED bulb upgrade kit is what you need! This conversion kit will allow you to run LED lights in the low beam without any issues. Many LED kits don't interface well with the Dodge Ram CANBUS system but the V.4 LED bulbs work great when partnered with the Dodge Specific CANBUS module as shown in our install video. SOLD AS A COMPLETE KIT FOR SINGLE BEAM STYLE HEADLIGHTS - Not for use with H13 bulbs! This kit comes with a vehicle specific CANBUS/PWM modules. This LED conversion kit bulb upgrade comes with everything needed to install on any 2009 - 2017 Dodge Ram truck with factory reflector style headlights. Cutting-Edge LED Chip Technology: We challenge you to find another bulb on the market that produces as much light as the V.4 while still retaining a perfect beam pattern! The V.4 LED headlight bulbs utilize the newest multi-core LED chip styles that feature one long crystal over the entire diode array to create a seamless light output source. Most LED headlight bulbs on the market essentially create 2, 3, 4, or 6 different light sources by stacking 2-6 different chips together in a line. 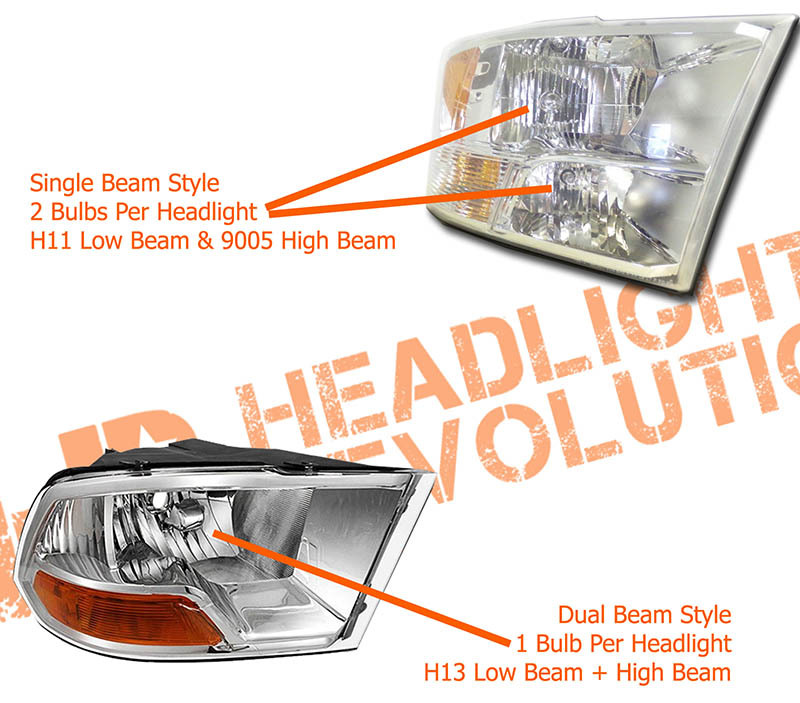 The NLW1860CV2 chips are based on XD14 technology developed by CREE, this custom designed LED chip has no light gap between diodes which gives it a closer function compared to the original filament bulb, thus achieving a greater beam accuracy that works best in any headlight or fog light housing. Thermal Management: The V.4 LED headlight bulbs are built from the highest quality 6063 aluminum material originally designed for aircraft and space craft applications. This material has amazing heat dissipation qualities as well as is 100% corrosion resistant in automotive applications. On the bottom of the heat sink lies a high-speed double ball bearing micro-fan that is fully submersible and waterproof! If the fan stops working, the sophisticated thermal management system inside the bulb will dim the headlight until it is safe to use. Considering that these bulbs can be up to 6x brighter than your original bulbs, even at 50% power, they will still be safe to use on the street in most situations. The heavy duty LED bulb power driver has a built in smart fan circuit that ramps up the speed of the cooling fan as necessary so it's as quiet as possible when it can be. Compact Design: Most LED headlight bulbs that use a fan-based active cooling system are known for not being small or easy to fit inside headlight housings with a dust cover. The V.4 is designed to be as compact as possible. The mounting depth is 20-25mm on most bulb variants, low profile enough to fit even the most demanding of spaces! And the heat sink / fan diameter is only 39mm! 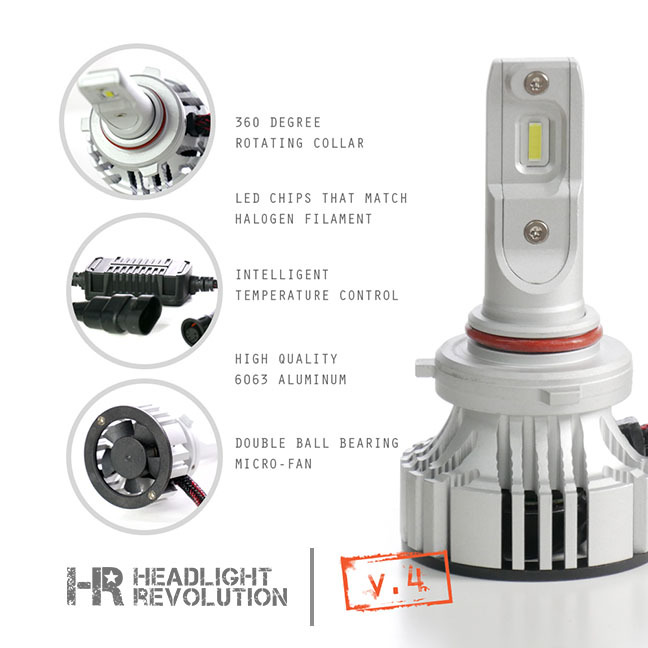 The LED driver on this bulb is larger than the previous generation, but it is still the right size to fit inside most headlight housings comfortably. CANBUS Compliant: Do your LED headlight bulbs flicker, pulse, give you errors and warnings on the dash? Do they even work at all?? Chances are your vehicle employs some version of CANBUS or PWM to control the lighting functions. These complex OEM systems rely on the physical readings of your original headlight filament to determine of your bulbs are operating properly. Simply put, when you install an LED headlight bulb, that function sometime determines that the bulb is broken, or missing entirely and will cause the truck to malfunction. Sometimes this means they don't come on at all, other times they flash, and sometimes they will suddenly shut off while you're driving! All of these things are solved by the built in CANBUS integration circuit found already inside the V.4 LED driver. Sometimes an extra PWM module may still be necessary, but this bulb is totally plug and play on the vast majority of vehicles on the road today, even brand new models! 36 Watts per bulb custom CREE-Style technology LED chips. Safe working temperature of up to 302 degrees Fahrenheit! Don't worry about these high-temp LED chips failing from overheating. 360 degree adjustable mounting collar for unlimited clocking/alignment options. This will allow you to achieve the best, most perfect beam pattern. Integrated Heat Pipe Design with low profile integrated heat sink fan. Weatherproof Construction and Shock Proof, CANBUS-Compatible Driver. Dimming: The V.4 bulbs dim less and less bright until they turn off at 8V DC. DRL: If the DRL function is lower than 8V DC, the bulbs will just not turn on at all. But if they use CANBUS or PWM at 12V DC they will work normally. CANBUS: Some vehicles use CANBUS function to monitor and control your headlight and fog light bulbs. The V.4 has a slightly larger LED driver than normal because the CANBUS anti-flicker and anti-error circuitry is built in! No external components should be needed to install these bulbs with a CANBUS-Equipped vehicle. Want your headlights to shine brighter and further but your current bulbs just aren't cutting it? Want to get rid of that old yellow light tint and give your ride an updated look with a cool white light beam? Look no further! These LED headlight bulbs will cast a precise light beam that will give you increased visibility, a wider viewing angle, and a much longer lifetime over conventional halogen bulbs. 2.50 amps Power Draw at 14VDC Per Bulb. LED Chips custom designed specifically for this bulb application.